Classes work on a drop-in basis and so there is no need to book places or sign up in advance. All materials are provided and included in the price of the class. Attendees are recommended to wear something they don’t mind getting dusty! €10 each for members of the public. I am really interested in pottery classes, and would like to know when it’s possible to start. You can start in September when classes restart. I wanted to inquire about Group classes. I would love to organize a session with some colleagues ideally on a Friday afternoon from 4.30 – 5.30 or thereabouts. Can you advise if this is something that you cater for and approximate costs for between 8-12 people? Hi, sorry it has taken so long for us to reply. You can drop into any of the classes whenever you want. Classes will not be on from around July until September. im very interested. It is possible to star in may or i must wait to september? Hi, you’re more than welcome to join any of our classes. The term runs from September until around July, so come in any time between these months! Hello Clasica Chic. I am interested too and I would like to start asap, not waiting till September. Did you find something ? Maybe we could make a group and find a teacher willing to give us classes during the summer? very nice article. it give me overall insights. Our pottery classes run Monday-Satruday and will resume again after the summer break on Monday 21st September. Classes are drop-in so you can come along to any of the classes from this date onwards. HI, I am interested in taking pottery classes. Can I start in November? How does it work? Is it everyday or can I choose to go twice a week? Hi, Yes you may start whenever you wish. You don’t have to come every day you can just come to the class whenever you are able. Hi, is this class open on saturday? And do I have to bring anything to join? What evenings are the classes on during the week? The classes are on Monday-Friday every week. Is it possible to attend classes at the moment? The classes are drop in so you can attend as soon as you’d like. I am a ceramist and I am looking for raw pottery to be glazed and decorated by myself, and then fired. Would it be possible to buy the material and pay for the firing at your shop? Hi Monica, I’m not sure if we can do that insurance-wise. Let me ask around and I’ll let you know. It would be very helpful if you could message the TAW Facebook page with this query as I’m not sure I can reply more than once to a question on this website and I do want to get back to you when I know more. Hi, I am interested in attending the Friday class. I went to the building last Friday but I could not find the exact entrance to the building/ art class! Could you give me some information on how I can actually access the building? Hi, just double checking that the classes are still on, are they still on for the month of may and june? Are the classes on now and during the Summer? Also, do you do gift vouchers for the class if I’d like to get it for my friend? How does it work if so. Hi there! The classes have ended and there will not be any classes during the summer but they will resume in September! Unfortunately, as for now, no we don’t do gift vouchers. 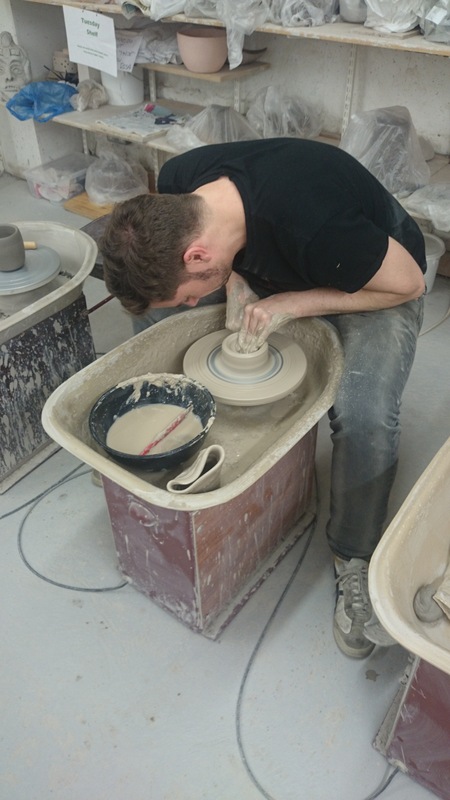 Hi, I am new to Dublin and I’m interested in taking pottery classes. Is the website class date current (classes restart Sept 5)? Is there a limit to how many classes you can take per week? Hi Linda, Sorry for the late reply but the pottery classes has already started which will happen every Monday to Friday at 6:00 to 7:30 & 7:30 to 9:00. Hi, just wondering when are classes resuming for autumn? Hi Mairead, the classes for 18/19 are now up on our website. There is no minimum age requirement, however, we recommend that any people under the age of 16 are to be accompanied by a guardian. Are new classes resuming for 2018? A group of us want to find a class in Dublin city centre. Thabks. Hi would it be ok to turn up next week or are classes fully booked? I think I join to this class next Tuesday. Is it possible or is the class fully booked. Hi Annkathrin, the classes are on a first come first serve basis so I highly recommend you get to the location earlier to avoid disappointment. Hi there. I’m a complete beginner but would love to give it a go. Would this class be suitable for a complete beginner, and if not, could you recommend a more suitable one?